Just before going back back to chaotic Manila from Mt. 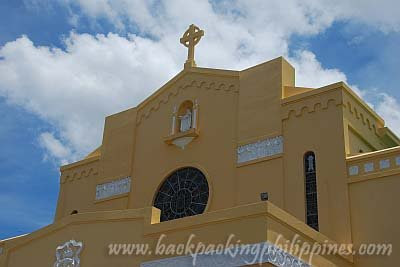 Malarayat, Tutubi and his officemates decided to drop by Our Lady of Mt. 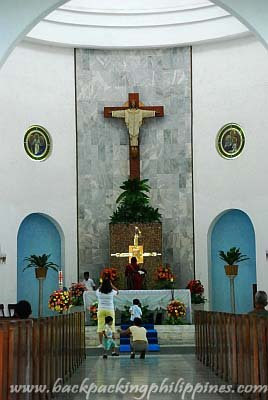 Carmel Church. Chaos of vehicles trying to get out of the church compound after the 12nn Sunday mass schedule. Catholic devotees attribute the images on the rose petals to Mary, who took on the name Our Lady Mediatrix of All Grace, though the Catholic has yet to fully investigate the event of the miraculous rose petals and release an official statement. Commute from Manila: Board any bus bound for Batangas City via Tanauan (Not via Calabarzon) in Pasay City (Taft Avenue near corner Gil Puyat Ave (LRT Buendia station) then drop off at the Lipa Cathedral. Mt. Carmel Church is walking distance away. Driving directions to Lipa, Batangas: from Makati, head towards SLEX then enter Star Toll and exit at Bulihan (access to Malvar town) turn left after the toll gate, and drive till you see a fork on the road with the Welcome to Lipa City sign. 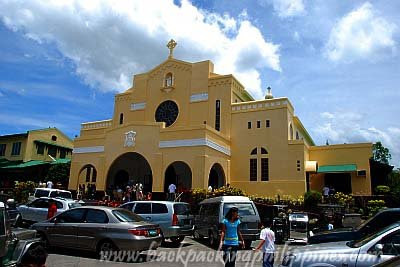 Choose left, continue driving until you see Lipa Cathedral (with the distinguishable dome) . Drive past the cathedral and turn left when you see Mister Donut. Mt. Carmel chruch is just there. These pictures is sooooo nice - so bright and so well captured - thanks for sharing! Have a happy Sunday po! That church looks pretty great, a nice piece of architecture! hello Mr.Tutubi...I appreciated all the beautiful photos you posted..! hi! ive been trying to find the mass schedule of this church but with no luck. would you have any info on this? mrslavendula, no information yet on mass schedules. i'll try to ask contacts there. that would be wonderful! were planning to take a relaxing (hopefully relaxing!) weekend drive there next sunday. I'm Rudy, I'm religious, i can say that Our Lady of Mediatrix of all nation is really true becouse I experinced her comfort during the time of my illness and i was curred by praying rosary and asking her intercession and that's not all during my birthday last april 2007 of evening, Mother Mary appeared to me in my dream and she introduce herself to me, she said I'm Our Lady of mediatrix of all nation and she ask me to spread her name to the world after that i feel different because how can i spread her name all over the world, I'm simple human and I don't know her title because that time it's new to me that title of Mother Mary.After my dream I visited the church together with the brothers and I bought a picture of Our Lady of mediatrix which this picture is really what I saw in my dream,even the color of her background and her image in my dream is really the same what picture i bought in that church in Lipa, until now this picture is in under my care and every time i see her im very happy, sometimes they like this picture,yes I lend them but during the day that our lady is not in my room I feel something is lacking. for those who will read this I'm not forcing you to believe in me, I just want to share what i experienced and the graces i recieved from her intercession. if you have some comment to me or something you want to know, you can email me in rudydespi@yahoo.com or visit me in my FB bro.clement@yahoo.com Thanks and God bless you all. 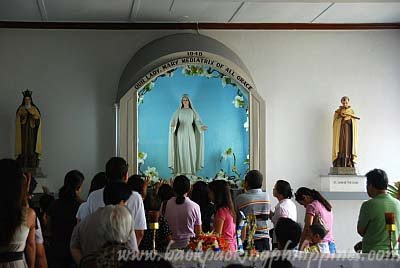 Our Lady of mediatrix of all nation pray for us. Every 12th of the Month there is penitential procession from Lipa Cathedral to the Carmel Monestary and 4PM Mass immedately follows. *If you miss the said masses, you can attend 9AM Mass at the Marian Center for Peace (accross Carmel, Lipa)and meet the "allegedly" visionary of Mary Mediatrix of All Grace apparition. If you miss the mass however in the afternoon, there is 5:30 anticipated mass in Redemptorist Chapel near Pauline Store in K. Lina St. Lipa City. *Carmel Monastery Lipa close at 6PM. May all of us recieve continously the blessings from our Lod and Savior through Our Lady. Drive to Lipa City. SLEX, SLEX extension then STAR TOLL, Lipa exit, turn right heading to Lipa City proper/poblacion. Robinson, wide intersection used to be a rotonda, McDo, use street on the right, statue, after Mercury Drug turn right, Mount Carmel Church about 1.5 km from Mercury, just after Lipa Grille Restaurant. Restaurant right side, church left side.